The father of a three-year-old boy says his son died in his arms while waiting more than an hour to see a hospital doctor. Basil Mohammed died in the A&E waiting area at Birmingham Children's Hospital last Wednesday. He had a rare syndrome that can lead to kidney or liver failure and his father, Muawai is questioning why he did not receive urgent care. The hospital is conducting a review and offered "deepest condolences". Basil had Wolcott Rallison Syndrome and was diagnosed at the city centre hospital, where the family said they received excellent care from the diabetes team. 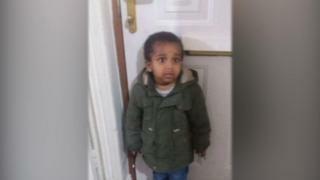 Mr Mohammed said his son was seen by a triage nurse within about 25 minutes last Wednesday but then left in the waiting room "for more than an hour". "I can feel him. He's my son... and I know he's going to go," he said. "I went back to them and I said 'he's going to go'. "They said 'what do you mean?' and I said 'he's going to die soon if you don't find me a doctor to see him soon'." Mr Mohammed said he wanted a full investigation into what happened and urged the hospital to review its CCTV waiting room footage. "I'm a dad. I have emotion," he added. Dr Fiona Reynolds, chief medical officer at Birmingham Women's and Children's NHS Foundation Trust, said it would work with the family through the investigation. "We would like to offer our sympathy and deepest condolences to Basil's family," she said. "When any child dies in our care we carry out an investigation to fully understand the circumstances and to provide answers for their loved ones." Image caption Muawai Mohammed said he told staff Basil was "going to die soon if you don't find me a doctor"